﻿ The Han Hotel, Da Nang | FROM $23 - SAVE ON AGODA! "The hotel is clean and good for what it is." Have a question for The Han Hotel? "The hotel provides great breakfast." "Good hospitality and we got to know more about Vietnam from him." 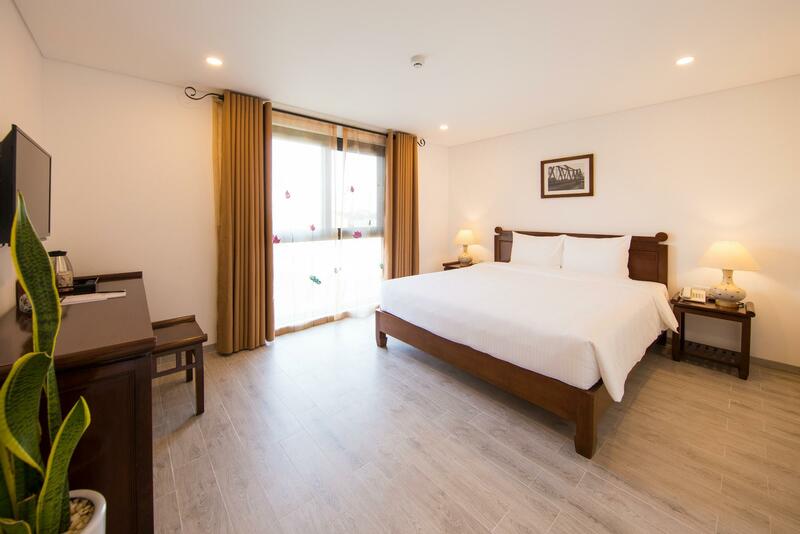 "Staff are polite, very friendly - Near to the beach - breakf..."
Ideal for fun and relaxation, The Han Hotel is located in the Phuoc My area of Da Nang. From here, guests can enjoy easy access to all that the lively city has to offer. With its convenient location, the hotel offers easy access to the city's must-see destinations. The Han Hotel offers impeccable service and all the essential amenities to invigorate travelers. To name a few of the hotel's facilities, there are free Wi-Fi in all rooms, 24-hour security, daily housekeeping, taxi service, 24-hour front desk. Guests can choose from 20 rooms, all of which exude an atmosphere of total peace and harmony. Besides, the hotel's host of recreational offerings ensures you have plenty to do during your stay. Discover an engaging blend of professional service and a wide array of features at The Han Hotel. "We enjoyed our time and will be back"
Children 6 - 11 years old will be charged VND 100,000 per child per night when using existing bedding. The location is 5 minutes walk to the sea, and within walking distance of plenty of eateries, so very good if you choose this location rather than by the river (which does have more food and bars etc). It's new, so there were a few minor issues which were all promptly resolved. The pool is tiny but that wasn't a concern. The staff were all helpful, although English is a bit limited. The hotel is about 2 blocks from the beach. There are many restaurants right nearby, however, they are tourist prices and it's mostly Korean tourists (depends what you want) . We prefer more local type stay so probably wouldn't choose this area, however, might be hard to find both good location in terms of beach and places to eat where locals go. The hotel is clean and good for what it is. Bed is okay. One of the front desk staff, Minh Anh was super helpful and professional. Made our stay very good! Also the breakfast was great. We had pho and eggs. You pick 2 mains and there's drink. It's not buffet style, but it's totally fine and since this is a small boutique hotel that's expected. The pool is more decoration than actually use it. Sparkling clean rooms with the most comfortable bed we’ve stayed in our entire stay in Vietnam, and the shower was amazing! Staff was wonderful and very helpful and allowed us to check in early after a 14 hour night bus ride. 4 min walk away from beach with a bunch of food stands nearby! I definitely recommend to travelers to stay here! The Han Hotel was a great place to stay in Da Nang. Although Da Nang was not our favorite place this hotel and their staff were excellent. The ladies at reception, River and Lily, made our stay feel like a home away from home. They made an extra effort to find out what our kids would enjoy for breakfast and then had it ready for them the next morning. It was very thoughtful. Thank you to entire staff. Good location for all sightseeing places, reasonable prices, and great services. The room is spacious and clean. We would like to thanks for The Han Hotel management especially the staff #River #Sarah #Lily. Thank you for the great arrangement for the surprise. We definitely will come back for our stay in the future. We are couple 👫 from Malaysia. Definitely will come back again. The hotel is new, staffs are friendly (can talk in English) good recommendation for foods and places. The hotel is very clean and spacious. Thank you for everything. Very happy to stay at this hotel! There was a Family Indian restaurant we liked to go to close by. And it is close to the beach, but many other western restaurants were about 10 minutes away. But we were happy to stay at this hotel despite this. They helped us with a tour for our last day and always very friendly. Air con worked well and had a very comfortable bed! Great style to this new boutique hotel.....Pool, Garden etc. It is very close to the beach and a convenient short Taxi ride to restaurants, shopping and city center or you can walk to some restaurants, coffee/smoothie shops and wine bars. Good and safe area. Rickie is super sweet (this is a family owned hotel) and she does a great job listening and helping with all your needs. Hotel is not well suited for families with small children but excellent for all others. Han Hotel is a class operation. Hotel is designed with great attention to details. Room is spacious and clean. Swimming pool is rather small but clean and refreshing. Breakfast needs to be ordered in advance. Some ingredients are from the organic garden next to the building. Good location. Overall a lovely experience. khách sạn đẹp. Đồ ăn sáng ngon. Vị trí gần biển nhưng không ở mặt đường lớn nên rất yên tĩnh. Nhân viên thân thiện nhưng tốc độ xử lý công việc còn hơi chậm. Gần khách sạn có công trường nên đường ra bờ biển hơi bụi bẩn, tuy nhiên không ảnh hưởng lắm đến không gian trong khách sạn. Chị Mai thân mến. Gia đình The Han xin gửi lời cảm ơn chân thành chị đã dành thời gian viết những dòng đánh giá rất ngọt ngào và ý nghĩa. Điều này sẽ là động lực để chúng em tiếp tục nỗ lực hơn nữa để mang lại sự hài lòng cũng như khẳng định chất lượng dịch vụ của khách sạn. Chúng em rất mong có thể lại được đón chị cùng gia đình trong một dịp tương lai không xa. Chúc chị một ngày mới tràn đầy năng lượng tích cực và một ngày làm việc hiệu quả. Gia đình The Han. This little gem is absolutely the best. The staff is beyond great. They will help you with everything possible. The hotel is only a block or so from the beach, with plenty of restaurants close by. Breakfast is very good , more than we could eat. The room was large with a very good bed and big comfy pillows. The grounds outside the hotel has a pretty vegetable garden, a nice lawn and a pool that is a work of art. This has been the best stay of our trip! Great hotel. Beautiful graden and pool. Staff were very helpful. Only downside and it’s a minor one is the walk to the beach has a block of construction. Wouldn’t stop me from staying here again..
Dear Mr/Ms Gerald, We would love to show our deep thankfulness and gratefulness to you for spending time writing these kind words for us. We are very glad that you had a fantastic experience a The Han Family, we really appreciate your comments about our services. We hopefully we will have the chance to host you. Warm regards, The Han Family. Rooms are very clean. 5-10 minutes walk to the beach. Half an hour walk to the dragon bridge. Breakfast is good but could be more extended. We had a pleasant stay and recommend this hotel. Dear Mr/Ms Cameron, Warmest greeting from The Han Family and thank you very much for your review. We’re pleased to see that you enjoyed your stay overall. We look forward to welcoming you back to our hotel in the not too distant future. Wish you are always lucky and have a lot of success in your life. Best regards, The Han Family. Hotel is clean, staff is helpful and friendly especially the manager Ryan who made sure our stay is well taken care of. Good hospitality and we got to know more about Vietnam from him. Definitely recommended. It's just a few mins walking distance to the beach. Lots of eateries nearby too. It was quiet small hotel but prepared every service. Staff was very nice. friendly welcome and help us. I really appreciate to them. Room condition also very nice. And the hotel was very close to myke beach and some restaurants, cafe and stores. And the breakfast also good. It was quiet basic and small scale but good enough for breakfast. I would like to recommend to everyone.